Is Car Dealer SEO an Effective Way of Getting More Car Sales? Home SEO Local SEO Is Car Dealer SEO an Effective Way of Getting More Car Sales? Is Car Dealer SEO effective? As a car dealer you have one main focus, sell more cars. Any marketing technique you decide to invest in should have the same focus. One of the main reasons why car dealer SEO is so important to your car dealership’s digital strategy is because SEO positions your business in front of your ideal client when they are looking for your service. Being able to position your business in front of a prospect when they’re looking for your service gives you a competitive advantage to your competitors. SEO is in fact a competition. 95% of all search volume goes to the first page of search engines. When someone is looking for a car there’s a high chance they’ll look online to try to get the best deal. If you’re website shows up on the first page, better yet, the first position for a search term that shows clear buyer intent you have a much higher chance of converting that prospect than if you did not show up for that search term. So how do you show up on the first page of search engines for these valuable keywords, simple, through the right SEO strategies. SEO, Search Engine Optimization, is the process of ranking a website higher on search engines (Google, Bing) with the intent of bringing a business more clients, sales, and brand awareness. The right SEO strategy will have your website show up for keywords used throughout the research and buying process. When someone is looking specifically for a “used toyota (in) san diego” you know they’re a warm prospect for your car dealer business. Every month there are 110 people searching for a “used toyota (in) san diego”. The image below is a screen shot with the search volume, CPC and competition data right under the search bar. Toyota makes great cars, but that doesn’t mean it’s the only make with this kind of search volume. Take a look at the search volume for “used honda San Diego”. 90 people per month are looking for a used honda in san diego every month. That’s 90 potential customers that could be going to your dealer. Now yes these terms vary by city, but If you’re in a large city similar to San Diego you can expect to see similar search volumes. These search terms don’t have the highest search volumes, but when you start ranking for multiple keywords you begin to see the full effect of SEO. 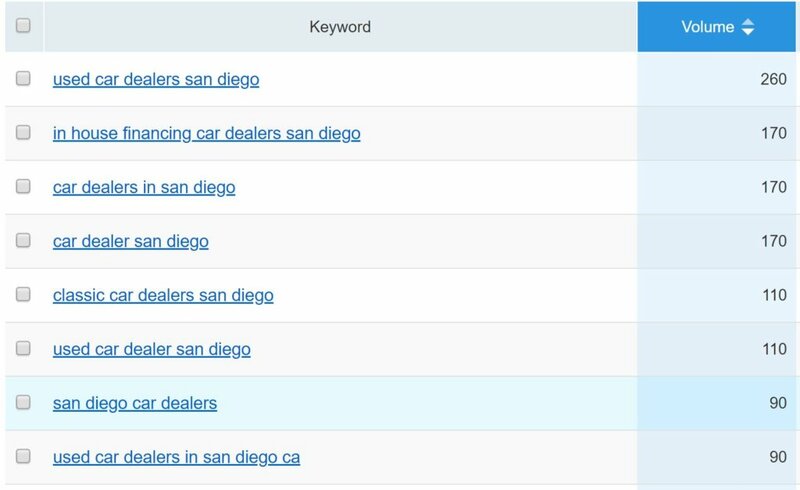 The image below has a quick list of keywords a car dealer in San Diego would optimize their website for. When you add up all of these keywords you get about 1,000 monthly searches in total. The right SEO strategy will optimize a website for every keyword that shows clear buyer intent. If you add all of these search terms together you can easily reach 1,000 monthly searches per month. If you get your website on the first page of search engines for all of these valuable search terms you’ll get a fraction of that search volume to your dealer. If you get even 10% of that the total 1,000 monthly searchers per month to your dealer that’s an extra 100 people in your dealership per month. The main take away is that there are thousands of keywords a car dealer can optimize their website for to get qualified leads and more importantly increase sales for their business. Getting traffic from keywords that show clear buyer intent, like the keywords I mentioned above will lead to more sales because you’re putting your business in front of clients that are actively looking to buy a car.